This is "Fire". 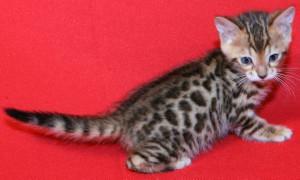 Her full name is Kajari Saphire Nights of Santa Fe Bengal. 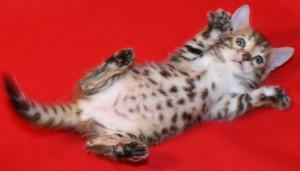 We are thrilled to have her here at Santa Fe Bengal Cattery. Fire has tested negative for HCM and PKD. She is silky smooth with crisp tri-colored rosettes and a gorgeous honey red background. FIRE IS SHOWN HERE PREGNANT WITH HER NEXT LITTER AND SHOWN WITH HER IS ONE OF HER DAUGHTERS, "FIRE'S EMBER"